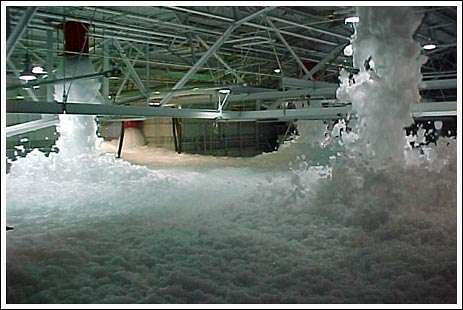 Some wild pictures here, depicting a veritable sea of foam. These airplanes will definitely be clean after that, but will they work? For example, this page describes how to wash smaller planes, but is that how they wash the larger ones?.. 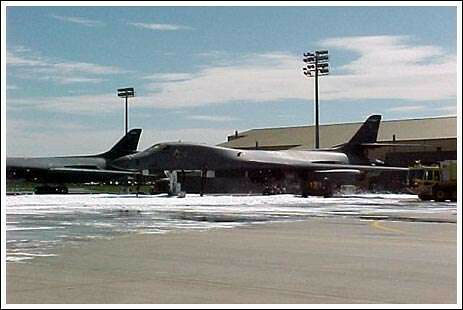 "Aircraft assigned to the 403rd Wings of America's Air Force now have a new purpose-built wash system, which blasts 2,000 gallons of water per minute, emitting 150 pounds of pressure from each of its 40 nozzles"
First off great blog, it's one of the sites I visit daily! 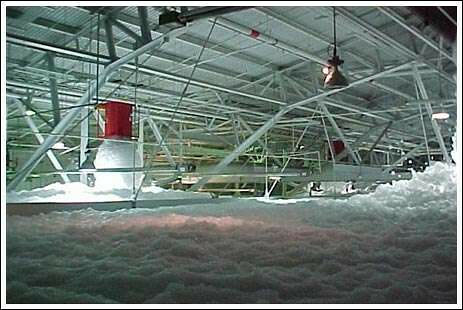 But the pictures in this post of the hanger being filled with foam, are actuallly of the fire suppression system. It is designed to fill the hanger with fire retarding foam in the event of a fire. Was going to comment the same thing Nils said, the system released the foam by accident. However, the pic with the turret, isnt that a plane beeing de-iced? 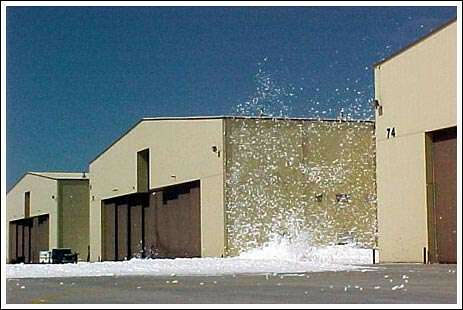 I believe the first twelve pictures are fire-suppression foam tests / accidents. 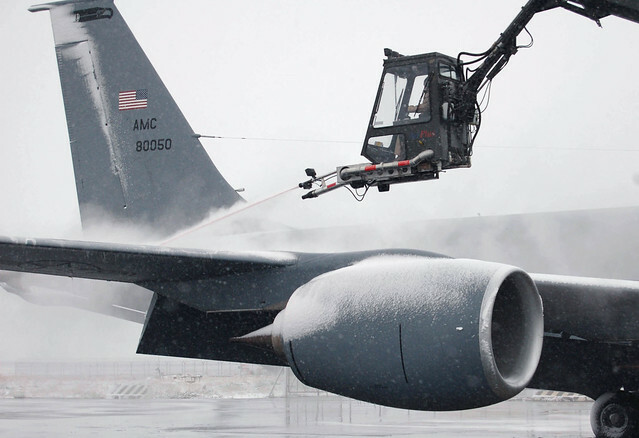 Then there's a shot of a pressure-rinsing system, a de-icing rig, and a flight crew scraping snow / ice off their aircraft. 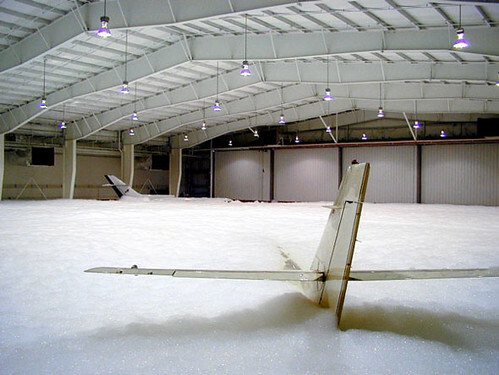 Aircraft doused in fire-suppression foam aren't squeaky-clean. The stuff dries to a nasty film and can damage finishes, wiring, exposed bare metal, etc. 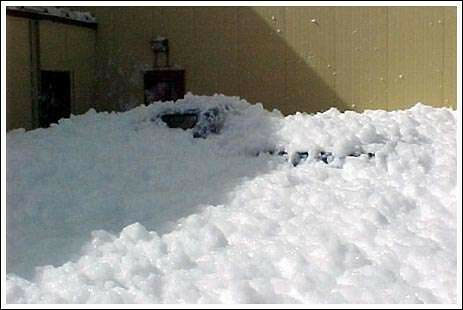 I've seen the photos of the fire-retardant foam incident before, but they're great photos and loved seeing them again. From memory the base is a USAF base in California and most of their aircraft were parked outside ready for training exercises. The day happened to be a fairly windy one as well. Also, the foam used is extremely corrosive. Naturally, most of the planes were touched by the foam, so all aircraft need at least a wash, and the ones closer to the hangar needed deeper maintenance. 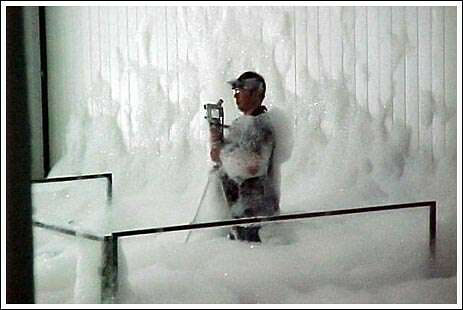 I believe that the foam pictures are the result of fire-supressing foam. As seen in the pictures it suffocates the source before it can do any significant damage. 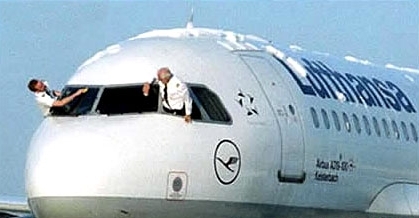 I'm not sure how well it works as an aircraft cleaner, though I'm sure it takes quite a while to clean up. 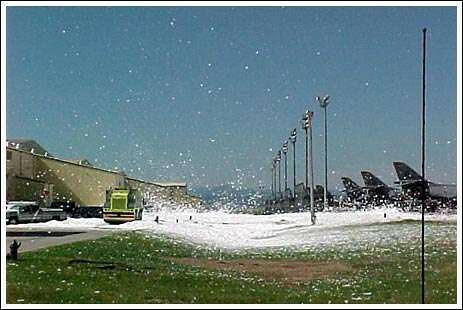 Fun photographs, but from personal account (I am former USAF member), this is fire foam. "Bird baths" are more like a hose-rigged gantry that the jets drive through for their post-flight washes. The very first photo happened like this: The hangar was equipped with a device for mixing soap concentrate and water for mopping the floor. The manager shouted to the man doing the work, "Don, turn off the machine." Don hears, "Don't turn off the machine." Thus, you get what we have here. It was a case study in the human factors course I got in the Air Force. There is also a picture of the hangar before it happened. As for the string of photos from the hangar full of foam: That was a test, the intent was to operate the system momentarily to check its operation. Obviously, no-one planned that the system would refuse to shut off, hence the people on the maintenance stands climbing to save their hides. There is a video somewhere of it all happening. Thank you Jim, great info! 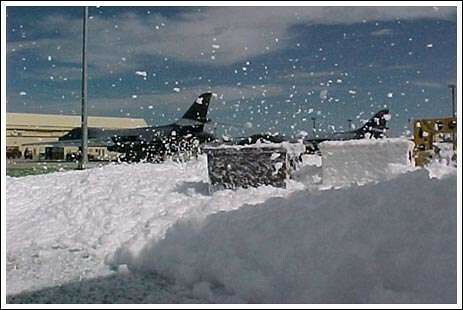 The foam pictures are actually from an Air Force base just east of Rapid City, SD. You guys are right in that they were running a test 'fire' on the newly automated system when the system wouldn't shutdown. There are also pictures of one of the cameraman's truck parked outside that had his windows down, and after they opened the hangar doors to let the foam pour out it filled and covered the truck. I have the full set of pics on an external harddrive somewhere. That next to last photo does not look like any plane at all. Some fancy architecture maybe?